The concept of the pen has been extant since the first millennium BC, when the Chinese started writing with ink on rat-hair brushes. Until the 19th century, quill pens made from feathers and reeds were the most common form of writing tool, but during the Victorian era metal nibs were introduced that could be dipped in inkwells, giving an increased writing length. 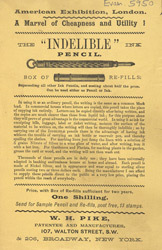 This is advertisement features an indelible pencil with an internal reservoir of ink.